A cat's nails need to be trimmed regularly. Whether you pay a groomer or the vet to trim them or do them at home, there are different techniques and safety concerns. This is a guide about trimming your cat's nails. When you get a kitten or a cat, and they are all mellow near you, reach out and start massaging their feet while talking to them calmly. Get them used to having their paws played with. I've lived with over 40 cats, and each of them like having a paw massage. They will even stretch out their toes! Then when it's time to trim nails, I spoon hold my cat (their back up against my tummy while sitting). With my arms around them, I have the trimmer ready and show it to them. Then I talk sweet talk to them and play with their toes. They relax and you can go ahead and trim them up, both front and back paws. Seven cats live with me now and I can do all 28 feet in under 10 minutes. I even used to have a cat come to me to get his nails trimmed, if they got too long. He didn't like 'long stickers'! Source: Years of experience and lots and lots of tabby toes! If you start massaging a cat's paws and feet and gently pressing them and working with their little paws each time you hold them, they won't mind so much when you trim their claws. Trimming the claws involves gently pressing the kitten's paw until the claws are visible. This does not hurt the cat. Trim a small amount of the hook off of the claw - never the whole claw, just the upper part of the claw. It is better to clip too little than too much. I play with my kittens' paws as part of their play. They come to expect it each time they are cuddling with me. I have a kitty, he is approximately two, that hates having his claws trimmed. You would think someone was inflicting great pain on him to listen to the howling that accompanies this task. It takes at least two people to do the job and even then he puts up a good fight. I do not want to have him declawed, been there done that, with other cats in the past. Otherwise he is a loving, funny inside kitty. Does anyone have any suggestions for how to trim them without further risk to life and limb, mine:)? I know that the vet or a groomer are options, but they can be pricy. Thanks in advance. I'm highly against declawing. It is very inhumane and extremely painful for the cats. I've never trimmed my cats claws. just my dogs (at the vets). They have something called "soft paws" and they are something you slip over the cats claws. It's painless and you can get them in a bunch of colors. I've never trimmed a cats claws either, never needed to. The pieces of carpet sample nailed to the door frames of a couple rooms took care of that for me. Also saved the furniture and the floor carpet. The cats have always known it was OK for them to use the carpet squares on the door frames, but not OK anywhere else (ye olde water pistol squirt training method:), and using the carpeting squares keeps me from having to even think about claw trimming. Wrap him in a towel so that one leg at a time is sticking out. I have worked for a Veterinarian for over 20 years. Trimming your cats nails can be very stressful for your cat and you. Please wrap your fur-baby in a towel with the front paws in front. Trim the nails as quickly as you can before he un-wraps himself, you might want to have a person help hold the cat and you trim the nails. I agree that declawing is inhumane and very painful. It is banned in Britain and so is tail docking and ear cropping. It is very cruel to do this to any cat...Our hospital would not do this procedure. 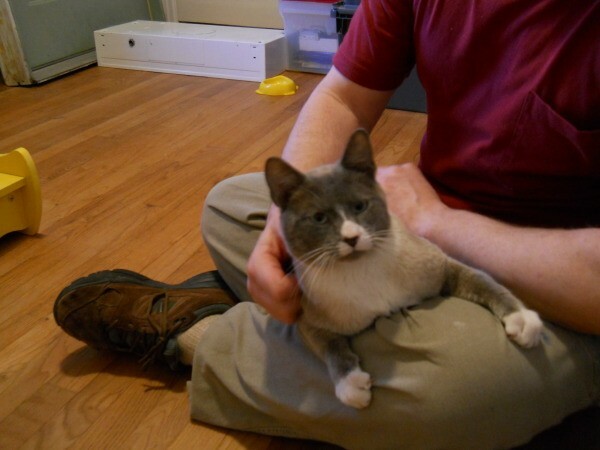 Applying "Soft Paws" is usually done for a cat that is scratching furniture and causing damage. This can be done by your Veterinarian and the soft paws must be glued on and they fall off easily or your cat will gnaw them off. Well, good luck... as a last resort you can call a groomer or go to your Veterinarian and they can trim the nails for you. There are natural herbal pet tranquilizers at the pet store. Buy one and give it to him wait 10 minutes for it to take effect. Then pet him and touch his paws but don't cut the nails. Next day give the tranquilizer and cut the nails. I do trim claws for both my kitties. They know they are going to get a treat right after, and they seem to be focused on that. If I'm not fast enough they do start complaining. I have my daughter hold them on her shoulder and as time goes by it has gotten easier. Isn't that what scratching posts are made for? I know there is great controversy over whether to declaw or not. I would like to mention, in case anyone here thinks I am intentionally cruel to have kitties declawed, that before judging someone as being cruel for declawing that you need to weigh the pros and cons 'of the situation'. Just as in weighing the pros and cons of pain in having a pet neutered or spayed so too do the pros and cons of declawing need to be weighed. The very first indoor cat I took in was already declawed both front and back. When I rescued the next cat he would attack her mercilessly and it was in no way shape or form a fair fight. In order to stop horrendous injuries I had to make a decision; either get rid of the baby with claws (no one wanted him) or have him declawed so that they would be equally yoked. Since then I've rescued many cats and there was one time there were four living peacefully and well in my home at one time. Each one lived to a healthy (mentally and physically) ripe old age except for one who got cancer at age six. Over the years the rescues I couldn't find a good home for and was able to afford to keep totaled eight. Each kitty family member was taken to a top notch vet, were given mild pain medicine the day of and the day after surgery and were running around playing as if nothing had ever happened within 48 hours. Oh, and as for 'situations': Even if I had never declawed cats before one boy, Jake, would have had to be partially declawed no matter what because not only was he polydactyl (eight on each front and five on each back) but two of the toes on each front paw were deformed and those claws got stuck in everything from carpet fibers to bedding. He actually nearly ripped one of the claws off trying to get it unstuck from the carpet with blood all over the place before I had him declawed. If my remaining baby, Rachel, passes away before I do and I do decide to take in another rescue I would choose not to declaw because there would be no need to. If you have a Pet Supplies Plus store near you, they offer nail trimming on Monday - Saturday from 9 till 5 p.m. The cost is only $4.00. That's a little better than the vets price to trim nails. I haven't taken our cat there yet, I probably will soon. Hope this helps. I have a beautiful calico cat that just showed up last summer at my door. After extensive advertising for the owner, and not finding an owner, she became my cat. My problem is that she comes in the house for a couple of hours every day, but she loves to be outside. I had her spayed, and shots, but she still has her claws. I would like her to be in the house all the time, but with the claws, it is not possible. Do people have cat's claws trimmed? If so, where do you take them to have it done? I do not want to have her claws totally removed, because she loves to be outside so much. So, who trims cat claws? Any vet practice can trim, look for one that specializes in feline care. Most will offer you a discounted fee if you bring a well behaved cat to the practice regularly. 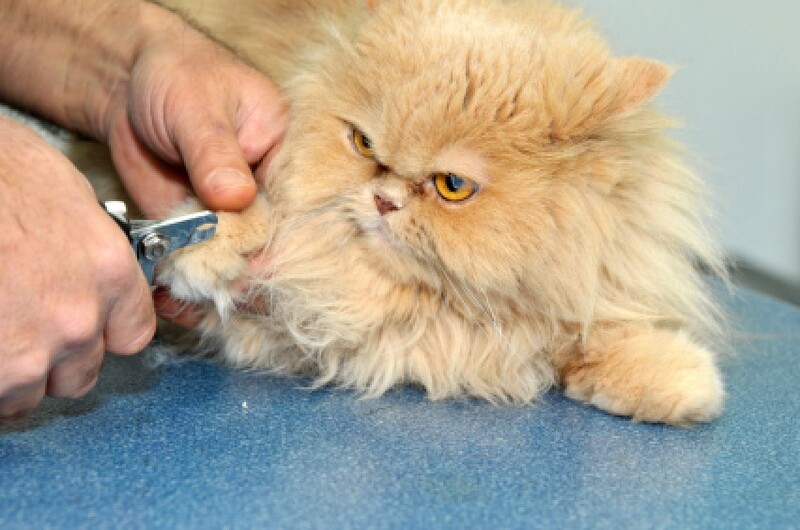 Some groomers can as well but you have to be careful about using a grooming service to trim a cats claws because grooming isn't a regulated service requiring training and licensing-anyone can hang out a shingle in the US saying they are a pet groomer. Trimming cat claws correctly is not easy and you want to be sure whoever trim those claws knows what they are doing. You can also learn to trim the claws yourself, ask the vet who likely will be glad to teach you. Any vet or groomer can trim a cat's nails, but you can easily do it yourself at home. There is also a product called soft paws which is a plastic nail cover which can be glued over the cat's nail thus preventing destruction when they use their claws. Please do not declaw the cat! This procedure destroys nerves in their paws and is extremely painful to them. Think about it; would you like someone pulling your nails out of your fingers? The vet will trim them for you. However at our vets,if one of the nurses does them it is cheaper. I have learned to do them myself and only clip a small piece off. There are plenty of videos on the Internet showing you how to do it. If you start easy with your cat they get used to having their claws trimmed. I have my daughter hold my cat over her shoulder and I pick up each paw and trim them. I only trim the sharp hooked ends. Then they get treats of course. Do not declaw. Declawing requires removing the last joint on the paw because the claws are so intergrated into the joint that they cannot be removed on their own. It is similar to removing your nail along with the finger to and including the 1st joint. The animal is literally crippled. My cats have never done any damage in the house with their claws.